Anyone who works with LaTeX knows how time-consuming it can be to find a symbol in symbols-a4.pdf that you just can’t memorize. 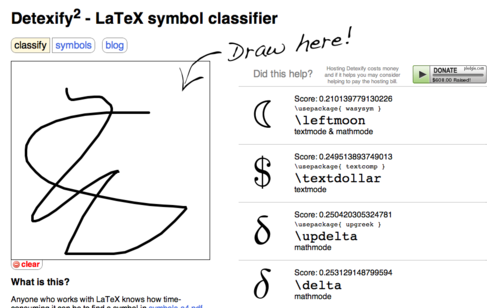 Detexify is an attempt to simplify this search. You simply draw the symbol you need the code for on a canvas and Detexify gives a couple of it thinks are the correct ones.